Until about a month ago, we had been buying all of our groceries at the local supermarkets. We tried AutoMercado, Perimercado, Mas X Menos, Saretto, MegaSuper, PriceSmart, Palí and Hipermas trying to test out which has better quality of food, price per unit/measure and variety. I haven’t given my full research post yet, but it’s in the works. However, for now, we are realizing that some items, certainly not all, are cheaper at the markets. But, don’t be fooled, not everything is cheaper at the ‘ferias’. Our regular shopping list includes onion, bell pepper, garlic, chicken, fish, lettuce, cilantro, tomatoes, broccoli, green onion and various fruit items. 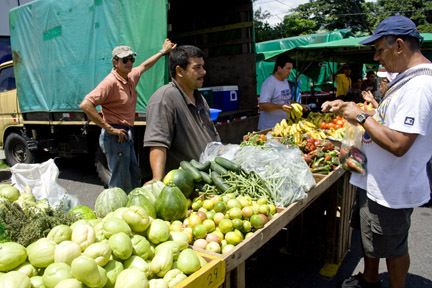 Finding cheap food in Costa Rica is much harder that it would seem and unfortunately for the citizens of this country, the cost of living has been rapidly rising for the last 5-10 years. So, the cost of food items is high along with the luxury and imported items we North Americans are used to. 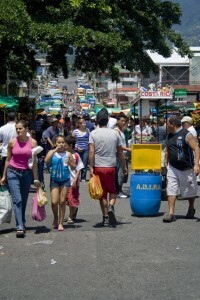 The grocery stores range in price on all items, as do the markets around San José. We have become regulars at the Saturday Pavas feria in our neighborhood adjacent to the Palí. The market runs from sun up to late afternoon and stretches about 500 meters down a through street (other than on Saturdays) with vendors on both sides. The people are friendly and the food is fresh, but do make sure you are getting a good price, specifically on eggs. I have found that they are no less expensive here than at any of the supermarkets. Buying frozen fish is certainly priced fair, as well as most of the produce. We can walk in with c 10,000 (about $18) and fill four reusable grocery bags. The flowers are beautiful as are the artisans handiwork available. 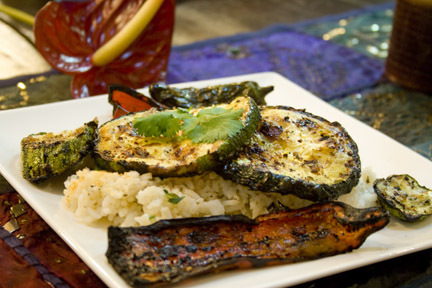 When we got home after the second or so visit, we knew the best option for dinner was grilled zucchini and bell peppers over coconut rice. I don’t know what the open flame does to food but it always takes things up a notch. 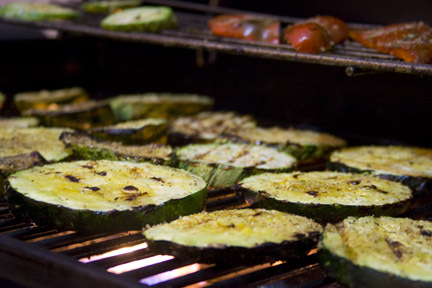 We’ve got a few other cheap grilling recipes on the site like grilled potatoes with onions and jalapeños and burgers with pineapple salsa. Also, check out the Food Costa Rica category to where you can find cheap food in Costa Rica.